Summary: Jim Harrison is a test pilot in the United States Air Force, one of the exalted few. He spends his days cheating death in the skies above the Mojave Desert and his nights at his friend Pancho's bar, often with his wife, Grace. She and Harrison are secretly desperate for a child-and when, against all odds, Grace learns that she is pregnant, the two are overcome with joy. I've mentioned more than a few times lately that I am very behind in writing reviews. One book that I feel horrible about waiting to write my review for is THE LAST PILOT by Benjamin Johncock. I admit that I have actually procrastinated a bit on this one because I was blown away by this story... and it's been difficult for me to convey my feelings. Rather that sitting right down and forming my thoughts about this novel, I've waited entirely too long and that's probably a disservice to the book and the author. THE LAST PILOT tells the story of Jim Harrison, a test pilot in the US Air Force, and his wife Grace during the 1940s. Being a pilot defines Jim and both his and Grace's lives revolve around that. Their friends are fellow pilots and their wives, and they hang out most nights with them at Pancho's, the local bar owned by Jim's good friend Pancho Barnes (a real-life character). Jim and Grace have unsuccessfully tried to have a baby for years, so when they learn Grace is finally pregnant, they are thrilled. Jim decides to pull back on his dangerous career, forgoing a chance to be an astronaut and stay close to his daughter Florence. However when a tragedy occurs in their family, Jim finds that all of his talents as a pilot won't translate into saving their daughter. Instead of mourning the loss with Grace, Jim decides to sign up to be an astronaut and move to Houston. Once Jim relocates, he becomes fully involved in the Space Race... even if that means pulling away from his wife and never really dealing with their loss. 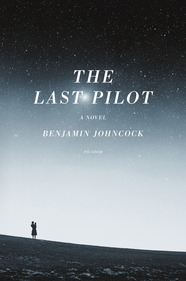 THE LAST PILOT is the debut novel by Benjamin Johncock and I have to say that he's an incredible writer. I honestly don't have the words to express just how talented he is. The prose was absolutely stunning, and the story and characters were equally compelling. All in all, this novel is very, very powerful (and unique) and one that I can't recommend enough! When I read the description for this novel, I wasn't sure that it really appealed to me. I'm not that interested in pilots or astronauts for that matter, and I still have flashbacks to visiting NASA all of the time as a kid. But after reading a few reviews (and a few emails from the publicist), I decided to give it a shot... and thank goodness I did because this book is one of my favorites for 2015! I probably won't be able to describe just how unique this author's writing style is. His prose is sparse with many of the sentences just being a few words -- truly like no other author I remember reading; and his dialogue is really good -- but with no quotation marks. In fact, if you skim through the book, I think you'll be surprised by just how unusual the dialogue and sentences look. His style could easily have been choppy and disjointed, and yet, it's not. It's perfect! I don't know how he managed to pull it off and make it appear effortless. I absolutely loved the characters in this novel. Jim and Grace, and their relationship, were fascinating. The dynamics between them were so real and many times very painful. I also loved how the author used the Space Race as the backdrop to their story. The juxtaposition of what was going on in the characters' lives and what was going on in the "real world" was especially powerful. And finally, I actually did enjoy learning about pilots and astronauts despite having my doubts. The author did a great job of researching this time period and bringing it to life for the reader. I was truly amazed by what these pilots and their wives did for their country. The technology was primitive by today's standards and they were really risking their lives each and every time they took flight. I also appreciated how the author incorporated real life pilots like Chuck Yeager and Gus Grissom into Jim's story. THE LAST PILOT would make an outstanding book club selection. There truly is so much to discuss about the characters and the changes that were occurring in our country. There is a reading guide available with sixteen questions. Some of the themes you might want to explore include family, parenting, sacrifice, love, grief, guilt, loss, the role of women, commitment, coping mechanisms, and hope. THE LAST PILOT is an incredible debut novel by a promising author. My review certainly doesn't come close to showing just how special this book really is. Highly recommended! Wow, your enthusiasm for the book is contagious - I'm dying to read it now.